For some individuals, technology can be as frightening as going to the dentist but at Copperleaf Senior Living, one form of technology has residents dancing in their seats! The IN2L or “It’s Never 2 Late-Dignity through Technology” system is an amazing tool that provides everything from guided tours through Europe to Karaoke for seniors. Since implementing the IN2L in Northridge Memory Care, “There has been a large increase in resident participation during activities,” noted Mercedes Ashe, Director. “Families have come up and said they’ve noticed a change in the level of interaction with their loved ones,” remarked Jackie Zdroik, Life Enrichment Coordinator for the Stevens Point campus of Copperleaf Senior Living. A daily activity program, as required by the State of Wisconsin, is designed to engage residents and aid in developing the highest level of functioning as well as promoting independence. A good program will stimulate the mind and memory of the participants and work toward reducing depression. Physical activity and movement can help to reduce blood pressure, slow the progression of certain diseases and reduce the risk of falling. Studies have shown that music therapy, when utilized with dementia residents, can reduce the need for depression medication, lessen agitated behaviors, increase social interaction and promote cognitive function and ability. Known as “Person-Centered Technology”, IN2L is designed to provide applications for recreation, social connection, memory stimulation and physical therapy all at the press of a button. The easy-to-use system offers cognitive stimulation, life-long learning and a variety of musical functions to engage residents. While Zdroik was demonstrating IN2L’s many uses recently, a small gathering began to form and soon Karaoke songs were appearing on the IN2L’s interactive screen and a handful of residents were singing, dancing, and clapping to the music. It was as though someone opened the window and sunshine began to pour in. The smiles and laughter confirmed the overall therapeutic effect this technology plays in the daily lives of residents. Zdroik said that one of the favorite videos of some of the elderly ladies is a ten-minute clip of babies laughing. Recently, one resident took a virtual trip to Germany where some of her relatives had lived. 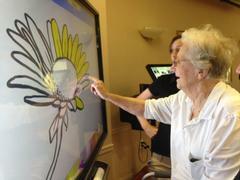 She enjoyed watching the German dancers and seeing the picturesque scenery on the interactive screen. A group favorite has been the hymn sing-alongs. Many enjoy singing songs they grew up hearing in church. There is a lyrics challenge which has the residents remembering lines from their favorite nursery rhymes and there is always laughter during a rousing game of “Hang-Man” remarked Zdroik.